I’ve failed to time my visits to Japan to coincide with the cherry blossoms that are out at the moment. 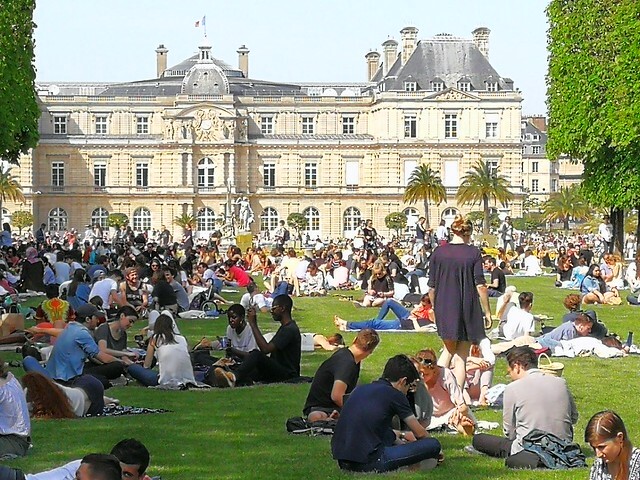 But this week the chestnut blossoms depicted in the song April in Paris are charming both locals and visitors alike, with standing room only in the city’s parks and gardens. Spring weather is of course variable, and this is the first week I’ve been able to cast aside the winter jacket for shorts and t-shirt. It was 28 degrees yesterday, with similar temperatures predicted until the middle of next week when it will dip ten degrees and we’ll once again be pulling our winter jackets from the wardrobe. It means a lot to me because I felt challenged by the sub zero temperatures and the snow in my neighbourhood on the day of my arrival on 18th March. Those who live here or visited earlier in the year had to endure floods, low temperatures and constant rain. Now it is possible to detect a definite upward swing in their spirits. Yesterday I walked through a few parks in an effort to capture something of this mood. 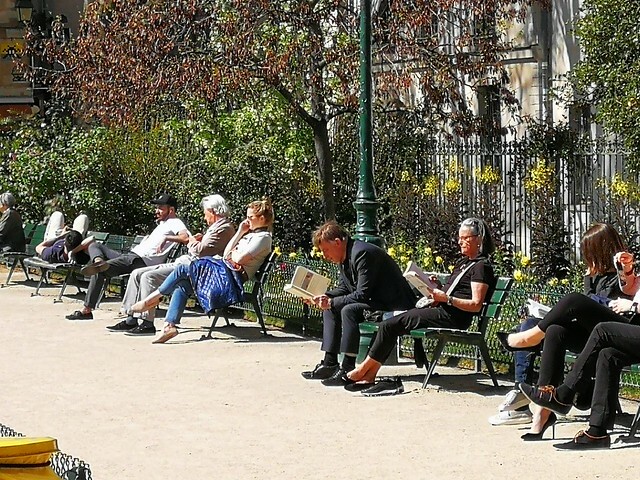 I’d wondered what Parisians do in springtime and thought I might see vigorous physical demonstrations of their love for each other. But it turned out that it was the bees that were in springtime overdrive, seemingly upsetting public order by getting too excited by the blossoms. 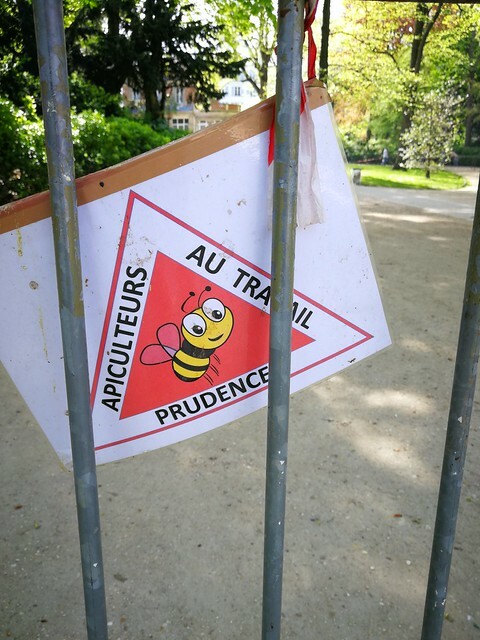 As I walked through the Luxembourg Gardens, I witnessed a bee emergency underway. There was a large area roped off and teams of beekeepers in helmets and white baggy suits trying to bring the situation under control, whatever that involves. It had never occurred to me that blossoms could be the cause of such consternation. Nevertheless visitors on the other side of the gardens near the Luxembourg Palace seemed unfazed. They were enjoying the weather chatting, reading and, of course, watching each other. When you spend time in colder climates, you notice that the contrast of the seasons can be much more pronounced than it is in Sydney and parts of Australia further north. In my view, it’s something to be cherished. In Australia there are increasing attempts to beat seasonality, for example selling cherries imported from California in winter. I buy them although I don’t like what such availability represents. I’ve noticed that the fruit and vegetables available in the shops in Paris tend to be those that are in season. At the moment the large white asparagus are everywhere. Next month it’s strawberries, eggplants, cucumbers, turnips and cauliflower. If you let it, seasonality brings variety in addition to the mood swings.